Hunting trips for us often also mean a fun camping trip for our family. We’ll commonly find a campsite near where I want to grouse hunt, pack up the vehicle with all our gear, and spend the weekend outdoors. While it means an opportunity for some quality family time, it also unfortunately typically equals a very full vehicle. If it was just me going I wouldn’t be bringing all that stuff, but any man that has ever been camping with his family before knows that just isn’t a discussion you want to get into. Enter roof racks for SUVs, otherwise known as roof baskets! I’ll break down the best roof racks for SUVs we’ve come across to help you make an informed decision on which one to buy. Like my dad always told me – “Keep it simple, stupid!” – Vault Cargo Management’s metal roof racks for SUVs certainly aren’t anything over-the-top fancy but the second you grab onto it you know it’s solid as all heck! With a 44″ x 39″ base frame welded out of steel tube & a steel floor, this sucker is everything you need and more. 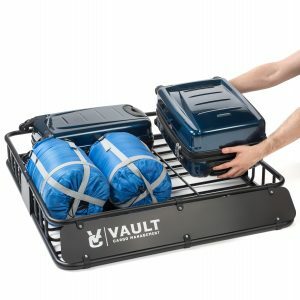 Vault Cargo Management lists a rated capacity of 150 pounds, which should be more than enough if you’re strapping down a few luggage items. 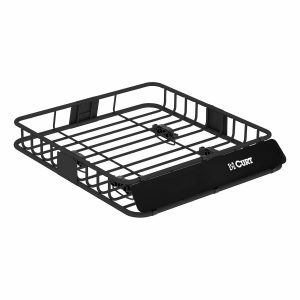 The carrier also comes with mounts that work with most rectangular style crossbars, and also holds the basket relatively tight to the vehicle. While this might not seem like all that big of a deal, it actually makes the unit stronger & more aerodynamic since your gear will be closer to the vehicle. Not sure if this was intentional on Vault’s part or not, but either way it’s a feature that I like about it. This is our go to roof basket for everything from camping, to hunting, and even for moving. We also actually pair it with their waterproof cargo roof bag, which protects our gear from moisture & keeps our stuff clean from all the grit of the road. It’s held up well during our trips and comes at a very reasonable price. Note: It looks like most of Vault’s items are slightly cheaper on their own website than they are on Amazon. If you don’t need Amazon’s 2 day prime shipping, I’d recommend checking there (they also offer free shipping). We’re going to lump the LoadWarrior & the MegaWarrior together simply because they’re basically the same thing, but with slightly different sizing. These roof racks for SUVs are definitely very well-made. From the second you pick them up, you can tell they’re built to last. To be honest, the only reason we’ve got them slated at #2 instead of #1 is due to the significantly higher price point. 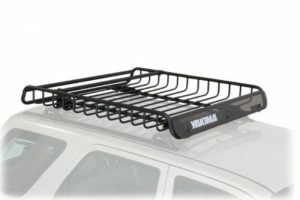 At around three and a half times the price of Vault’s roof rack for SUVs, Yakima is definitely going for the premium market. The sizing on the Yakima MegaWarrior roof rack for SUVs is a larger than Vault’s, so depending on the size of your vehicle it may or may not make sense. The MegaWarrior is listed at 52″ x 48″, while the LoadWarrior is more comparable to Vault’s at 44″ x 39″. Both of these styles come with mounting hardware to fix to different styles of crossbars, and the paint job does seem to be of good quality. Once again, these roof racks for SUVs are certainly very well made. There’s very little not to like, with the only exception being the price tag. It’s a bit more than we’re willing to pay for a metal roof rack, but Yakima fans out there have shown that they’re willing to pay more for Yakima gear. You can check out prices for the LoadWarrior on Amazon here. If you’re looking for a larger basket, you can check out prices for the MegaWarrior on Amazon here. 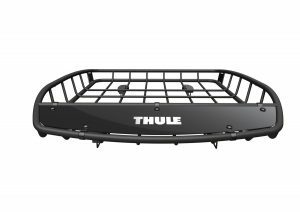 If you’ve spent any amount of time looking into roof racks for SUVs you’ve almost definitely stumbled across Thule. Thule boasts a huge offering of higher end products. While a lot of it is clearly higher quality, some of it is pretty clearly more expensive simply because of the brand name. While the Canyon XT is certainly nice, we’re ranking it below the Yakima racks simply because it feels like you get more bang for your buck with Yakima’s products. The Canyon XT is definitely a crowd pleaser with a sleek, streamlined design. We certainly aren’t going to take anything away from it for its looks, but it’s the racks functionality that has us scratching our heads a bit. While it offers a wind deflector to help direct wind over your luggage, the wind deflector is at such a severe angle that it is basically only there for looks. The bottom few inches of your luggage will certainly be out of the wind, but anything over the height of the rack & they’re going to be blowing all over the place. This isn’t to say this Thule Canyon XT is a bad rack by any means – far from it actually. It’s clearly well built and a solid option if you’re looking for higher end gear. Much like Yakima customers, Thule fans are typically willing to pay a bit more for their gear. You definitely get a good roof rack for SUVs with the Thule Canyon XT cargo basket, but in our eyes Yakima wins the battle of higher-end roof racks. You can check the price of the Thule Canyon XT on Amazon here. If you are looking for a vehicle cargo rack with an option for a folding shank, you may want to look towardsÂ Curtâ€™s metal roof racks for SUVs. While I donâ€™t personally care for the paint that Curt uses (a majority of their complaints stem from rusting), I know there are many that do. Curtâ€™s unit is quite similar to Vault Cargo Managementâ€™s for the main part of the basket, but the reason it falls a bit short is due to the paint they use. As I mentioned before, most of the complaints on Amazon’s reviews are based on rusting. Itâ€™s pretty clear from the pictures that people have posted that this unit scratches relatively easily, and it is pretty apparent when you actually compare the unit to Vault’s. If youâ€™re a fan of Curtâ€™s and want to stick with them this certainly isnâ€™t a bad option. It will definitely get the job done, but I feel there are one or two shortfalls here. You can check prices for Curtâ€™s roof racks for SUVsÂ here. This is a prime example of something looking great in photos, and not so great in person. The ROLA V-Tex rooftop cargo rack looks unique & high quality in photos & even comes with a higher price point to make you feel like you’re getting a premium roof rack. However when you get it in person it tends to be quite underwhelming and, quite frankly, a bit disappointing. Aside from being significantly lighter duty than expected (the tubes diameter is wider, but very clearly thinner material), the overall design doesn’t make a ton of sense when you put it to use. If you’re planning on using ratchet straps to secure your luggage you’re likely not going to be able to get the hook around the main tubing of the ROLA V-Tex. That really left us scratching our heads a bit. While this is certainly a unique-looking unit, we’re going to stay away from this one. There are simply better options out there. Vault Cargo Management offers a better option at a lower price point, and if you’re looking for a high end roof rack for your SUV you can go with one of the options from Yakima. You can check prices for ROLA’s V-Tex roof racks for SUVs here. That about does it for our list of the Top 5 roof racks for SUVs. If you enjoyed this list & still need a bit more space, be sure to check out our cargo hitch carrier edition!